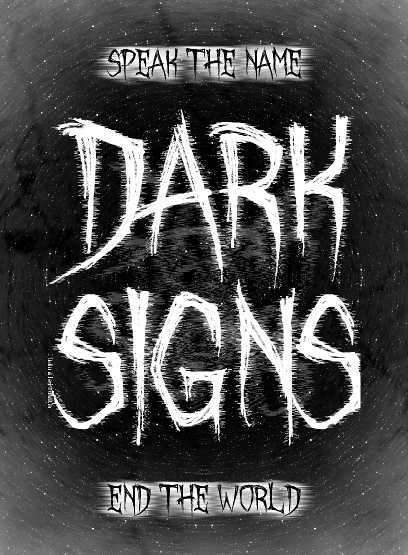 Here at Invincible Ink we’d like to announce the launch of Dark Signs! If you’ve ever walked a midnight plane of black sand under impossible skies while watching the clashing forms of impossible immortals that do not hate you because they do not recognise you as even an entity worthy of hatred, if you’ve ever wanted to break through the realms between realms and destroy the world that these flesh things inhabit, then Dark Signs might be for you. Sound cool? You can get all of this for $15, here, on DriveThruRPG! You feel that chill on your spine? That hushed breath of Halloween through clenched teeth? The scrabblings of things against the surfaces of something that you’re sure doesn’t really exist? It is the season of terrible things, and that makes it the perfect time to share Dark Signs. Dark Signs is a game about nightmares, and unknowable words. It is a game of area control, and playing the puzzles players put before you. It is a game of pushing your luck and ending the world. Dark Signs is a game I devised while thinking of myself, and of friends, of people who know what it is to be wrong to the reality we live in, and to try and give people an idea of what it is like to have these jagged, strange thoughts in our head. Dark Signs as a game looks… strange. Unsettling. It may feel unnatural and slightly eerie. It’s a game about unnatural words and strange powers. It’s a game about invocations, about making traps and luring your friends close. It is a game about the end of the world, and the shuddering, startled-awake ache of remembering places that even now flit from your memory. With that in mind, if you like the sound of it, or the style – consider buying it.